Now that both conference finals series are wrapped up, who will win the NBA finals? 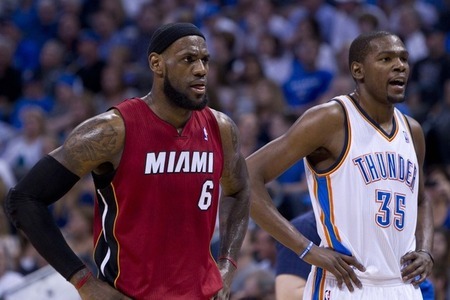 Both the Thunder and the Heat faced difficult, intense series in their previous matchups. The Heat went to Game 7 against the Celtics, who simply just ran out of gas at the end of the series. The Heat also faced elimination in Game 6 of this series, but LeBron James had one of the best playoff performances of his career to lead the Heat to this much-needed victory. James had 45 points, 15 rebounds, and 5 assists on 73% shooting. With all the momentum going their way and playing at home in Game 7, the Heat were able to beat the Celtics with a strong run at the end of fourth quarter. Chris Bosh had 19 points and 8 rebounds off the bench, while shooting 80% from the field and 75% from three-point range. Rajon Rondo had a triple double with 22 points, 10 rebounds, and 14 assists, but his stellar play wasn’t enough to give the Celtics a victory. The Celtics didn’t play strong defense at any point in the game and really struggled with their help defense. James was able to penetrate and get easy baskets at the basket, because the help defense came too late. Even when the help defense came on time, James was able to dish the ball out to Chris Bosh, who hit almost every shot he took. 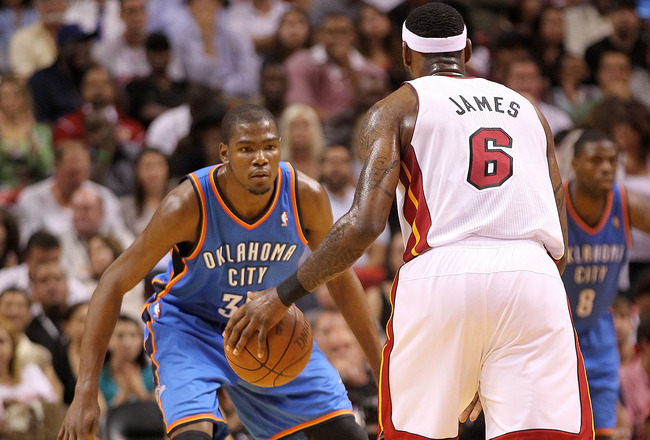 The Heat will try to continue to play their style of play against the Thunder. They will continue to play their trademark trap defense and try to run their transition offense as much as possible. The Thunder play a similar style of play, meaning they play their best when they run and push the ball into transition. The Thunder have been classified as a jump-shooting team, but with the insane amount of talent and athleticism this team possesses, that classification might become irrelevant. With this style of play, the Thunder were able to stop the Spurs’ historic 20-game winning streak, and they sent the Spurs to four consecutive losses in seven days, which is as many times as the Spurs had lost in the previous 12 weeks. This is a miraculous feat on its own, but even more importantly, this young team has sky-high confidence right now. If they continue to play their fast-paced, gritty style of basketball, it seems like no team is going to be able to stop them this year. In 15 games this postseason, Kevin Durant has averaged 27.8 points per game, 7.9 rebounds, and 4.2 assists while shooting 50.5% from the field and 36.7% on three-pointers. Westbrook has averaged 21.7 points per game, 5.1 rebounds, and 5.6 assists while shooting 43.6% from the field and 34.9% on three-pointers. James Harden has continued his excellent bench play while averaging 17.6 points per game, 5.2 rebounds, and 3.3 assists while shooting 45.2% from the field and 44.6% on three-pointers. The Thunder’s “Big Three” have stepped up in numerous ways during the postseason, and they’re going to have to even more in the Finals. The Thunder might be inexperienced and young, but the biggest asset they have going for them is that they are a well-rounded team. In addition to their “Big Three,” they have a fierce competitor in Serge Ibaka, and they also have veteran presence and leadership in Kendrick Perkins, Derek Fisher, Nazr Mohammed, and Nick Collison. The Miami Heat have three of the best players in the league, but that’s about it. Shane Battier has contributed significantly this postseason and Mario Chalmers and Udonis Haslem have contributed occassionally, but besides that, Miami really has no bench. James and Wade have been asked to play significant minutes in the postseason so far, especially in the Boston series, and that might make it difficult for James and Wade to keep up with the rested, young Thunder. Furthermore, the Heat have also experienced some luck throughout these playoffs. Not to discredit their accomplishments, but the Heat must have been happy that they faced the Celtics in the Eastern Conference Finals and not the Bulls. If Derrick Rose had not gotten injured and the Heat had faced the Bulls, would the Heat still be going to the Finals? It’s not clear. Even so, if Ray Allen, Avery Bradley, and Paul Pierce weren’t battling injuries, would the Heat still be heading to the Finals? It’s still not clear. The Thunder have paved their own way to success. They make no excuses and don’t let anything get in their way. This season’s Finals will be a competitive, memorable series with several highlights coming from both teams on a nightly basis. However, the Thunder have the “X factor” in this series. They are a true team with humble, smart players, and they will not be stopped on their run to the NBA championship. Last season after the Thunder lost to the Mavericks in the Western Conference Finals, they knew they had to grow up and mature in order to reach the Finals. This season, they have really grown up and are here to prove that. This is the Thunder’s time to shine.